Udupi, 05 Sep 2015: Being a priest, Fr. Clement Mascarenhas began his professional career as a teacher and proved to be an ideal teacher winning the confidence and admiration of thousands of students who still fondly remember him as their mentor and guide. With an experience in teaching coupled with administrative ability he rose to the position of headmaster and later principal of PU College in some of the prestigious secondary and higher secondary educational institution spread across the then undivided Mangalore Diocese. Having served in the educational filed in different capacities for a long period of 30 years he opted for VRS and volunteered to serve in the newly formed Udupi Diocese where he had the opportunity of being appointed as the Secretary of the Catholic Education Society (CESU)and eventually took charge of St. Lawrence Church, Moodubelle as the Parish Priest and Correspondent of St. Lawrence Educational Institutions. On the occasion of the Teachers Day, Bellevision.com is pleased to review the long period of service of Fr. Clement as a priest, teacher, headmaster, principal, Secretary of Catholic Education Society of Udupi(CESU) and correspondent and also his talents as a music composer and administrator. Born on 23 November 1954 as the eighth among nine children, four boys and five girls of late Thomas and Stephania Mascarenhas of Kelmbet-Bola in Karkala Taluk, Fr. Clement had his primary education at the Little Flower Higher Primary School, Kelmbet up to seventh standard and secondary education in Board High School, Belman where he completed SSLC in 1969-70. Having had a strong desire to serve the church as a priest, Fr. Clement joined St. Joseph’s Seminary, Jeppu, Mangalore soon after completing SSLC. When asked about the factors that prompted him to join the seminary, Fr. Clement without mincing words said that his parents who lived a simple and prayerful life were instrumental in his priestly vocation. Secondly, the then parish priest of his parish, Late Fr. Gregory D’Souza nurtured his desire to join the priesthood. Besides, two of his elder brother-Fr. 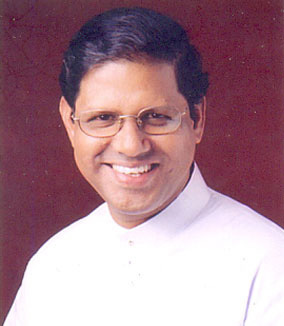 Eugene Mascarenhas, presently serving in the Allahabad Diocese and Fr. 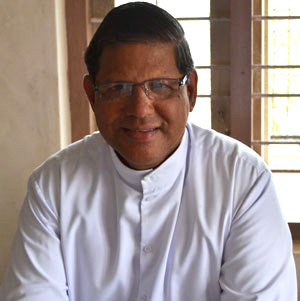 Fred Mascarenhas, Presently Dean of Udupi Varado had dedicated themselves to the service of the church which further strengthened his resolve to join the seminary. The example of three elder brothers was followed by his youngest sister, Sr. Julie Anne (AC)-presently Superior of AC Convent at Gangolli. As a young boy, Fr. Clement was quite active in the church as an altar server and singer and used to attend all masses on Sundays and render his sweet voice for singing hymns, a trait that helped him to grow as an accomplished musician, singer and composer. While studying for priesthood in St. Joseph’s Seminary, Fr. Clement completed PUC and B.Sc. studies in St. Aloysius College, Mangalore and also acquired the Bachelor of Theology Degree (BTh) from the seminary. The seminary also provided him to develop his talent for music and learnt to play violin and keyboard. Having completed successfully all the mandatory courses in preparation for priesthood, Fr. Clement was ordained a priest in 1981 in St. Joseph’s Seminary, Jeppu and soon after was appointed as the Assistant Parish Priest of Derebail Church near Mangalore where he served for one year from 1981-82. Having realised that Fr. Clement had great potential to be a teacher, the diocesan authorities asked him to undertake teachers training course which he did from the Government College, Mangalore from 1982-83 while residing at Rosario Cathedral and acquired the B.Ed. degree. Soon after completing the teachers training course, Fr. Clement was sent to Mount Rosary Church, Santekatte-Kallianpur as Assistant Parish Priest with additional task of teaching assignment at the Milagres High School, Kallianpur as Assistant Graduate Teacher where he served for two years from 1983-85. With his reputation as a sincere and effective teacher, Fr. 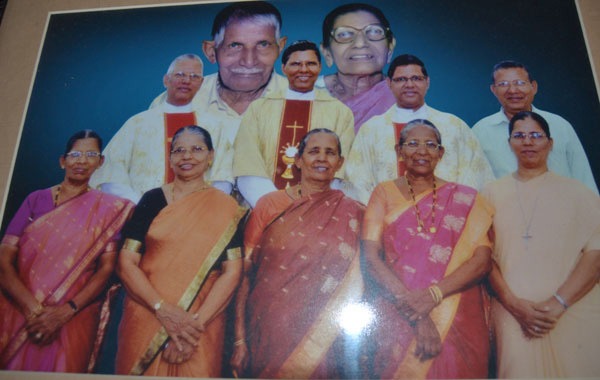 Clement came to the notice of the diocesan authorities and he was sent to St. Philomena High School, Puttur, where he served for seven years from 1985 to 1992. During the last two years of his term (1990-92), Fr. Clement was elevated to the coveted post of Headmastership. While he was the headmaster of the school, one of the students, Prabhanjan acquired seventh rank in SSLC at the Karnataka State level. Fr. Clement had the gift of music right from his childhood which he nurtured and it bore fruit while he was in Puttur where for the first time he began composing liturgical hymns and Konkani songs. He continued this talent which enabled to compose many more hymns and bring out devotional CDs. Having gained sufficient experience as a teacher and headmaster, Fr. Clement was appointed as the headmaster of Rosario High School, Mangalore where he had the longest and most fruitful assignment for 12 years from 1992 to 2004. Meanwhile, he was the resident priest in the Rosario Cathedral where he rendered pastoral service especially in training the choir. As teaching and administration was his forte, Fr. Clement still wanted to broaden his horizon by further studies and acquired M.Ed. and MA degree in English literature from the Mysore University. Having armed with post graduate degrees both at the academic and professional level, Fr. Clement took the bold step of establishing the Rosario PU College in 2002 with Arts and Commerce sections and took up the twin responsibility as the Headmaster of the Rosario High School and Principal of the newly established Rosario PU College from 2002 to 2004. It was during his stay at the Rosario Cathedral that Fr. Clement made it a point to give wings to his musical talents and ventured to produce his first CD of devotional hymns titled ‘Jai Christa’ in 1994. Later, Fr. Clement teamed up with another versatile musician priest, Fr. Valerian Mendonca who was at Milagres PU College, Mangalore and both of them pooled their musical talents to compose and direct devotional CDs, a trend that led to the publication of 35 CDs out of which 25 CDs comprise of hymns and Konkani songs and rest in Kannada and Hindi. The recent CD that was jointly produced by Fr. Clement and Fr. Valerian is ‘Vailankani Mae’ was released on 15 August 2015 comprising of Marian hymns. This CD was sponsored by the Stella Maris Parish, Kalmady and the proceeds from the sale of this CD will be utilized in the construction of the new church which is underway at Kalmady. The last and most significant assignment of Fr. Clement in the field of education was his posting as the Principal of St. Sebastian Composite PU College at Permannur-Thokottu, an institution which he nurtured and developed as a model educational institution for nine years from 2004 to 2013. His greatest achievement at Permannur was the construction of an entirely new school-college building with three floors, the top floor being utilized as an auditorium. Fr. Clement gratefully remembers his old students, friends and well-wishers who helped him with donations to construct such a huge and beautiful building. St. Sebastian PU College has all three sections-Arts, Commerce and Science. The effectiveness of Fr. Clement as an educator and administrator can be gauged by the fact that it was during his tenure as the Principal of St. Sebastian Composite PU College, the number of students in the high school gradually went on increasing. In St. Sebastian Kannada Medium High School there were five sections each in eighth and ninth standards and four sections in tenth standard. Similarly, PU Commerce class had additional divisions. For his dedicated and noteworthy service as a teacher, Fr. Clement was honoured as the Dakshina Kannada Zilla Best Teacher Prashasthi Award in 2005. With the bifurcation of the Mangalore Diocese and creation of the new Diocese of Udupi in 2012, Fr. Clement opted for the latter diocese and sought voluntary retirement (VRS) in 2013 at the age of 58 and moved to the Udupi Diocese. 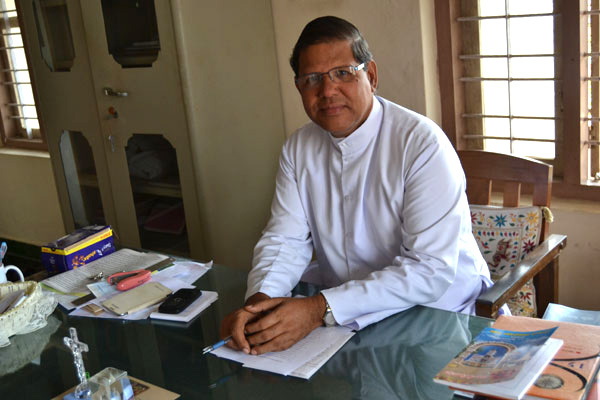 The Bishop of Udupi Diocese, Most Rev. Dr. Gerald Isaac Lobo appointed him as the Parish Priest of Kemmannu church where he served for one year from 2013-14. Meanwhile, in order to coordinate the functioning of the Catholic Educational institutions in the Udupi Diocese, the Catholic Education Society of Udupi (CESU) was established and Fr. Clement who had wide experience in the field of education was appointed as its Secretary, the post that he held till he was appointed as the parish priest of St. Lawrence Church, Moodubelle and the Correspondent of St. Lawrence Group of Educational Institutions on 19 May 2015. On the occasion of the Teachers Day, Bellevision.com had an interaction with Fr. Clement Mascarenhas about his experience as a teacher, headmaster, principal and correspondent and his expectations from the teachers and students. BV: You have spent major part of your priestly life in the field of education as a teacher, principal and presently as correspondent. Which of these roles you find most challenging and at the same time satisfying? Fr. Clement: All the roles that i have played in the educational sphere have been quite important and challenging. As a teacher i was responsible to the education and discipline of the students assigned to me and i tried my best to educate them in the best way possible. I considered myself as their friend and guide rather than an imposing task master. As a headmaster, i was responsible for the entire institutions and had to deal with not only the students but also their parents and staff members. I had to take everyone with me and see to it that all the components worked in harmony and cohesion. This was indeed the most challenging job and i am happy that i could fulfil my responsibility as the educational institutions that i had served have grown. As a Correspondent i have had only three months in Moodubelle and St. Lawrence Educational Group has five Institutions. This is a greater responsibility to see to it that all the institutions function efficiently. However, i can say that it was as a teacher i had the most satisfying experience. BV: You had the opportunity to educate thousands of students. What can you say about the students say twenty years ago and present generation? Fr. Clement: There is a lot of difference among the students say twenty years ago and present times. The earlier students had less comforts and they were much more hardworking and dedicated than most of the present students whose financial condition is much better compared to earlier times. These students have many facilities and hence they are complacent and their concentration on education is much less than the earlier students. BV: What are the challenges faced by teachers in educating the children under present circumstances? Fr. Clement: Under the present circumstances teachers have many more challenges than the teachers of olden days. Discipline among the students has been deteriorating and there are few options for the teachers to discipline the students. As some of the students use modern gadgets like internet and explore, they gain information which the teachers may not have and when they counter the teacher in the class with this information, the teachers cut a sorry figure which may lower their self-esteem. Hence the teachers have to be at least one step ahead of the students in gathering information and knowledge. BV: What are your expectations from the teachers who serve in your present institutions? Fr. Clement: I am happy to state that all the teachers who serve in our educational institutions are quite good. However, there is still scope for improvement. The teachers should have a good class management which can be achieved by a teacher by planning and executing the course to be taught, maintaining discipline in and outside the classroom, being an inspiration by words and actions and being a friend and guide rather than posing as a person who should be feared by the students. Healthy interaction between the teachers and students as well as other staff members would foster good atmosphere in the institution. Of course other factors such as punctuality, dedication and loyalty to the institution, etc are the usual expectations from the teachers. BV: Do you think that celebration of Teachers Day once a year will motivate the teachers? BV: According to you what makes an ideal teacher? Teaching is an exciting and challenging career, full of personal rewards and a chance to encourage and support others to achieve their maximum potential. In addition to the necessary academic requirements involved in becoming a teacher, they also need to develop the skills required to effectively teach and become outstanding teachers. Belle Church is blessed to have Rev. Fr. Clement who is a dedicated and devoted priest who cares for the needs of all the parishioners. We wish you Father, all success in your pastoral ministry at Moodubelle. Thank you Dr. Eugine for presenting the beautiful profile of Fr. Clement Mascarenhas.He is an inspiration and a role model for all the teachers. He holds so many titles in managing the Educational Institutions @ different levels, surely we are blessed. With his vast Experience, knowledge, skills and leadership abilities I don t think he will face any difficulty in managing our Educational Institutions and our Parish as a Whole. I am your student , you are the inspiration for each and everyone those who we re come across you sir , I still remember your beautiful smiling face that make the student to study and moral empathise , I remember the maths class of yours. sir you are explaining each and everything , may god bless you sir. Thank you Dr Eugene for introducing Fr Clement to BV readers. Even though I have not met Fr Clement personally, have heard many good things about him. The result of his Charismatic leadership can be already seen in recent youth activities. Wish you all the best Fr Clement. Under your leadership, may Belle parish grow in unity. A hearty welcome! Fr. Clement to Moodubelle. Thank you Dr.Eugene for introducing (Teachers day special) our new Parish priest and correspondent of St. Lawrence Educational Institutions to BV readers. A very senior priest and highly experienced Teacher, Headmaster and Principal (VRS) of Fr. Clement s credentials, I do not foresee any difficulties for him to manage the day- today affairs of a vibrant church like Moodubelle and its educational Institutions and of course with the cooperation from the friendly parishioners. Even though I have not met him yet but I am very hopeful that Fr. Clement Mascarenhas with his vast educational as well as administrative skills will succeed in prevailing over any adversaries in case if they arise in the near future. I am extremely happy to read about his academic brilliance, love for music and administrative experiences which will help him to overcome the Bellean s expectations to do away with tough decisions. My best wishes to Fr. Clement. He seems to be a good priest, genuine person with great potential and also with a good background. This article is really praise worthy. I hope, he will not be influenced by the localities like the previous priests. I am honored to know Fr. Clement Mascarenhas. Thank you so much to Dr Eugene Belle Vision for putting an brief biography of our beloved Parish Priest. Few weeks ago, I met him in Church and fortunate enough to get his holy blessing. He is a humble, loving person. I pray God to keep him in good health peacefull life. Dear Dr Eugen Nice detailed interview I met just 20 days back our Parish Priest and he is good listener and having good patience. He has spent his life as a teacher but I hope and pray he will take this opportunity as challenge and many changes will happen in our institutes and church and its surroundings. He also have some innovative ideas . Wishing him all success and good wishes. very apt to interview our new correspondent of St. Lawrence Educational Institutions as he completes four months in his office. Typically, most of us were offered a probation period of three months, after which we may be confirmed, probation extended or terminated. Fr. Clement does not have to worry about termination but his new office will present him big problems which may he turn into opportunities. 1. Shortly, he will preside over the closure of the degree college that was inaugurated with much fanfare three years ago. (Post mortem!) 2. The enrolment is dwindling in Kannada medium elementary and secondary schools, with PBC, SC, ST and EWS (economically weaker students) opting as an option of last resort. Sustainability is the challenge. 3. The English medium high school (1-10? )is flourishing. This decision made about 12 years ago only quickened the death throes of Kannada medium schools. How do you align an rich-poor divide caused by medium of instruction? 4. The mindsets of rural community and local and state government (system) is regressive, leaning more towards cultural revisionism. The chasm between aspirations of youth as students and the system huge. G luck! Great mentor, an inspiration to the youth , multi talented! May God bless Fr Clement with good health and long life! Nice article Dr.Eugene, In my personal experience after interacting few times with Fr. Clement, he is a keen listener and his level of understanding is quite high, we are very fortunate to have him as Parish priest and specially as the Correspondent of our educational institutions. With his vast experience, vision and motivation we can rest ensure the success of our future generation, who come out of our institutions. May Lord bless him to lead this parish to greater heights. Thanks for this nice interview of fr. Clement on the occasion of Teachers Day who is a renowned teacher, Principal, Administrator and a Parish Priest. Great Personality. My association with him very short but I observed him as an able administrator and a people friendly priest who listens to parishioners. He immense knowledge is definitely helpful in building St. Lawrence Institution in Moodubelle. As he said its a challanging job for the teachers as currently students are equipped with modern method of learning through interenet and our teachers must get used to these methods and well prepared for the current generation of students. Wishing Fr. Clement all the best in his mission which he has already started and initiated a few projects. Wish him all success. Thanks Dr. Eugene for this wonderful intereview. Thank you Dr. Eugene for introducing profile of Fr. Clement. Our parish is lucky to have such an experienced and talented parish priest, educationist and administrator for our parish and institution. Wish him a great teachers day and all the success in the tenure of Moodubelle parish. Nice Article on Teachers Day about Parish Priest himself as a Teacher,Principal.It s nice to see Fr.Clement transfered belle since he always support try to bring out the Youth in all activities. Example Music/Sports.We are sure youth will reach major heights by his guidance.